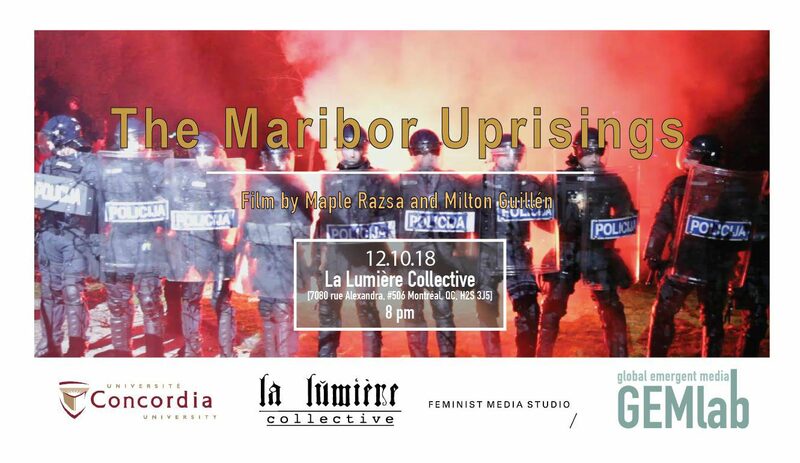 Maribor Uprisings (2017) is an interactive film by Maple Razsa & Milton Guillén, and is presented in collaboration with la lumière collective. Politics of Alternative Media is a year-long project conceived as a series of workshops, screenings, and lectures organized by a collective of researchers, artists, and curators gathered around la lumière collective, Concordia University’s Global Emergent Media Lab, and Feminist Media Studio. It aims to foster the exchange of ideas about grassroots, non-commercial and emancipatory practices using media as instruments of mobilization, empowerment, and community building. As an effort to counter the intensified reconfigurations of media landscape according to neoliberal logics, the project advocates forms of media cultures accessible to everyone and simultaneously invests in reimagining alternative media formations. PAM is curated by Giuseppe Fidotta, Sima Kokotovic, and Sanaz Sohrabi. About the event: In the once prosperous industrial city of Maribor, anger over political corruption became unruly revolt. This participatory documentary places audiences in the midst of the third and largest uprising as crowds surround and ransack City Hall under a hailstorm of tear gas canisters. Soon the mayor will resign—and the movement will spread to cities across the country. The Maribor Uprisings takes up urgent questions raised by these events, and by uprisings elsewhere, from the Arab Spring, through Paris, to Black Lives Matter. What sparks such popular outrage? How are participants swept up in—and then changed by—confrontations with police? Could something like this happen in your city? About the Alternative Media Cultures Project: The Alternative Media Cultures project explores how grassroots, activist, and non-commercial media-makers deal with the practical concerns they encounter in their projects. As such, it showcases the work of a variety of cultural producers with a specific focus on the operations necessary to build an alternative media infrastructure. It also promotes a hopefully fruitful exchange between actors, audiences, and institutions on the practical quandaries related to the production, circulation, and sustainability of these models. The project is a platform for developing research modules and analytical tools for understanding the contemporary entanglements of media and activism, while at the same time creating a leeway to foster bonds of solidarity amongst cultural workers engaged in the pursuit of alternative media cultures.